On November 15, 2018, Kim Cantwell (Menno Home Care Manager) will speak to Family Council on Infection Control and the importance of educating residents, families and staff towards prevent infection in residential care. We will also focus on our support based discussion that started last month. Not everyone understands the journey you are on, and as family members, you share similar experiences and emotions. Our hope is that you will feel encouraged, supported and strengthened to continue this ongoing journey with your loved one. 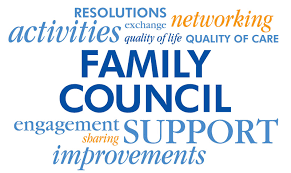 At last months Family Council meeting, members provided their ideal availability for Family Council and the Support Group. The majority suggested every third Thursday, every second month from 3-4pm. Due to the time change, we will now be meeting in the Menno Hospital Conference Room from 3-4pm. Please contact Social Workers Dan Janzen or Kim Wiebe for directions if need be.